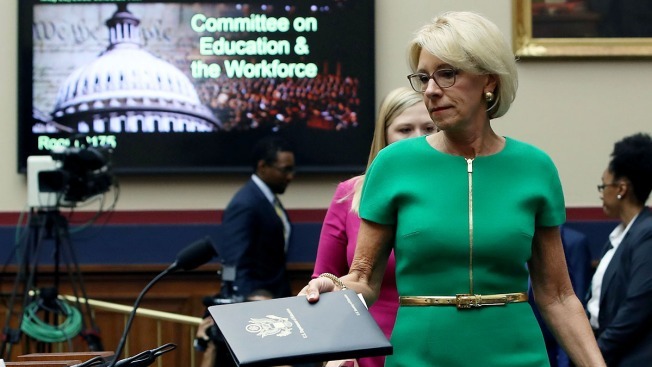 Education Secretary Betsy DeVos arrives to testify before the House Education and the Workforce Committee on Capitol Hill, May 22, 2018, in Washington, D.C.
Civil rights groups and educators lambasted Education Secretary Betsy DeVos after she said schools can decide whether to report undocumented students and their families to immigration authorities. DeVos made the comments on Tuesday during testimony before the House Committee on Education and the Workforce in response to a question on whether principals and teachers should report undocumented students or families to Immigration and Customs Enforcement, NBC News reported. Rep. Adriano Espaillat (D-N.Y.), who asked the question, immediately slammed DeVos' comments, saying that it's not up to local schools to define immigration policy. “Let me just remind madam chair that immigration law is federal law. It's not local law," said Espaillat.